Each editorial is written by one member of the editorial board as solicited by the editor. 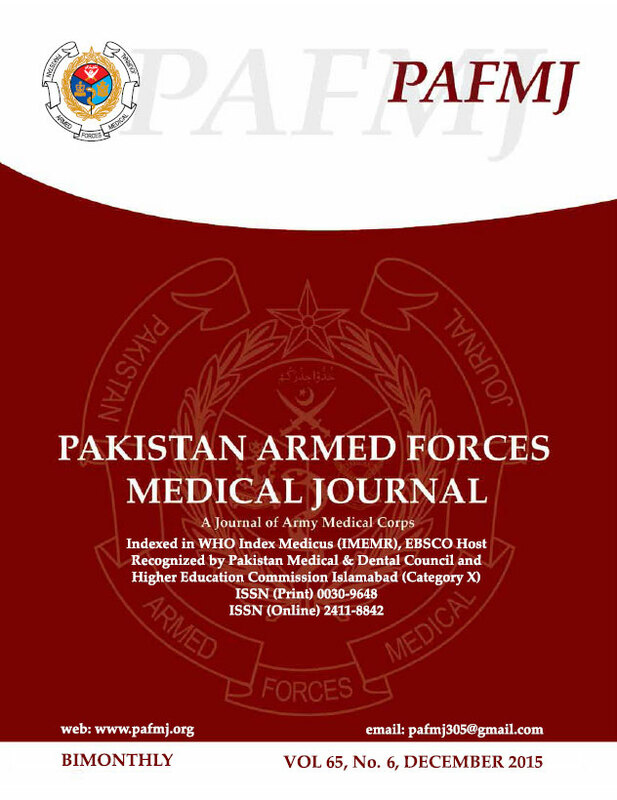 The editorial is scientific review on one or two of the current topics pertaining to medical sciences (preference is given to subjects pertaining to Army health problems). Patients and Methods: This should include exact method or observation or experiment. If an apparatus is used, its manufacturer’s name and address should be given in parenthesis. If the method is established, give reference but if the method is new, give enough information so that another author is able to perform it. If a drug is used, its generic name, dose and route of administration must be given. Methodology section should contain (Without headings) study design, place and duration of study, sample size, sampling technique, inclusion and exclusion criteria, data collections procedure and data analysis procedure. Statistical method must be mentioned and specify any general computer programme used. The Info system used should be clearly mentioned. Results: It must be presented in the form of text, tables and illustrations. The contents of the tables should not be all repeated in the text. Instead, a reference to the table number may be given. Long articles may need sub-headings within some sections (especially the Results and Discussion parts) to clarify their contents. Extra or supplementary materials and technical details can be placed in an appendix where it will be accessible. It may be omitted from the printed version but may be published in the electronic version of the journal. Discussion: This should emphasize present findings & the variations or similarities with other work done in the field by other workers. Detailed data should not be repeated in the discussion again. Emphasize the new and important aspects of the study and the conclusions that follow from them. It must be mentioned whether the hypothesis mentioned in the article is true, false or no conclusions can be derived. Conclusion: Should be in line with the objectives and results. Conflict of Interest: When authors submit a manuscript they must disclose all financial and personnel relationship that might bias their work. Authors must state explicitly whether potential conflicts do or do not exist. They should do so in the manuscript on the title page. Additional details can be provided if necessary in a covering letter which accompanies the manuscript. Authors of study funded by an agency with proprietary or financial interest in the outcome must sign a statement that they had full excess to all the data in the study and take complete responsibility for the integrity of the data and the accuracy of the data analysis. This statement should be submitted along with the manuscript. Acquisition of funding, collection of data, or general supervision of the research group, alone does not justify authorship. All persons designated as authors should qualify for authorship & all those who qualify should be listed. · All persons designated as authors should qualify for authorship and all those who qualify should be listed. · Each author should have participated sufficiently in the work to take public responsibility for appropriate portions of the content. · In case of more than one authors in a manuscript, the contributions of each person listed as author in the study should be mentioned. When a large, multi-center group has conducted the work, the group should identify the individuals who accept direct responsibility for the manuscript. These individuals should fully meet the criteria for authorship defined above and editors will ask these individuals to complete journal-specific author and conflict of interest disclosure forms. When submitting a group author manuscript, the corresponding author should clearly indicate the preferred citation and should clearly identify all individual authors as well as the group name. Other members of the group should be listed in the acknowledgements. Addition and deletion of authors may not be permitted after submission with authorship proforma signed by authors. You CH. Lee KY, Chey WY, Manguy R. Electrogastrographic study of patients with unexplained nausea, bloating and vomiting. Gastroenterology 1980; 79: 311-4. Chapter in a book: Weinstein L, Swartz MN. Pathogenic properties of invading micro organisms. In: Sodeman WA Jr, Sodeman WA, eds. Pathologic physiology: mechanisms of disease. WB Saunders, Philadelphia 1974; 457-72. 4 Tables and Figures: 3 – 5 figures and or tables are allowed (each table, complete with legends and footnotes, should be merged in the manuscript). 5. Proof Reading: Final version of manuscript is sent to corresponding author for proof reading before publication to avoid any mistakes. Corrections should be conveyed clearly & Editor informed by e-mail. It has been decided by the Editorial Board to include articles relating various aspects of military medicine in the journal. These articles reflect various medical problems faced by the troops deployed in the field or hard areas and the preventive measures to overcome them. Rapid/Special/Short communication should be complete work, not merely a preliminary report and should not exceed 1500 words with one figure and/or one table. An editorial decision will be provided rapidly without reports. For writing and references style, please refer to the instruction above. Short report of cases, clinical experience, drug trails or adverse effects may be submitted. They should not exceed 700 words, 10 bibliographic references and either two concise table or one figure. The report must contain genuinely new information. Opinions on topics and articles recently published in the journal will be considered for publication if they are constructive in nature and provide academic/clinical interest. These letters will be forwarded to author of the cited article for possible response. The editor reserves the right to shorten these letters, delete objectionable comments, make other changes, or take any other suitable decision to comply with the style of the journal. Note: All articles submitted to PAFMJ must only be submitted to this journal and may not have been published elsewhere in part or total. The authors will be requested to sign an agreement to give the copyright to the publishers. The authors will be required to assist the editors for reviewing proof before publication. Authors are required to send letter from Institutional Review Board / Biomedical Ethical Committee / Ethical Review Committee must be sent along with Original articles, Rapid communications and Case reports.